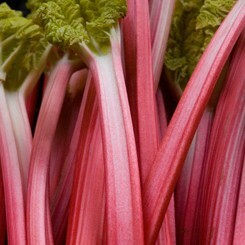 Wash & chop the rhubarb into chunks. Place in a bowl with the granulated sugar & turn so the rhubarb is well-covered with the sugar. Set to one side. To make the sponge place the flour, butter/margarine, caster sugar, eggs & vanilla essence into a mixing bowl & mix using an electric hand mixer or food processor. Add a little milk if the mixture is too stiff. Turn the mixture into a deep sided sponge tin. 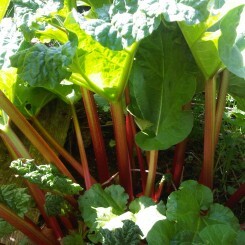 Then drop the raw rhubarb & sugar mixture on top of the sponge mixture. Place in an oven at around 180-200 degrees and cook for 40 minutes. Serve with custard or crème fraiche.